All Pricing for a 9′ ceiling. Additional $350 per foot up to 11′. 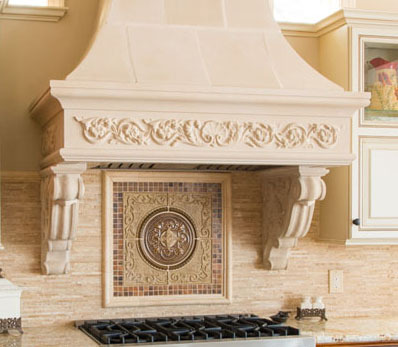 No space is too small for the Le Petite cast stone range hood but don’t be fooled by it’s name. This compact range hood makes a big impact and adds luxurious character to any kitchen with it’s soft curves and delicate design. It’s sure to be a visual and conversational focal point at any gathering. Particularly suited for situations with limited space, this stunner can be done with or without the carvings. Other alterations are possible, so long as ranges retain the integrity of their original design. 5 out of 5	So many compliments! We purchased 2 fireplaces [Stamford & Calais] and a range hood [Le Petite] from you about five years ago. We absolutely love them and have had so many people comment on them. 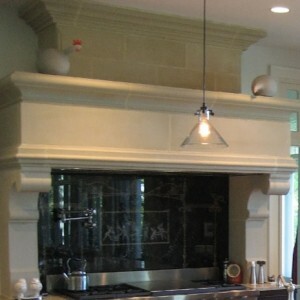 The range hood in particular is always a conversational piece at all of our parties. Many thanks for making such beautiful products that have truly enhanced our home and given it a very authentic old world feel.